Sooo... got. New diary and phone case and they are both tastefully monochrome. Was thinking a quality Dredd/2000ad sticker could liven them up. Surprised Rebellion don’t do this, any good sites out There? Googled. It and just got wall sized ones, are they sanctioned by Rebelion? 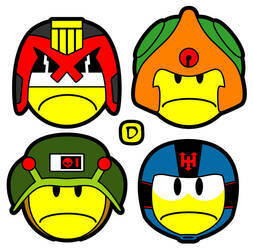 I'd be up for a Dredd sticker or two (or maybe ABC Warriors) to liven up my headphones. I don't think he has any of these available anymore but I was lucky enough to score a couple from him for my pencil tin.